Summertime can be the best time of the year – vacations, more time with family and friends, longer days and warmer temperatures. But along with those warmer temperatures comes the problem of how to keep comfortable and cool when the mercury rises. 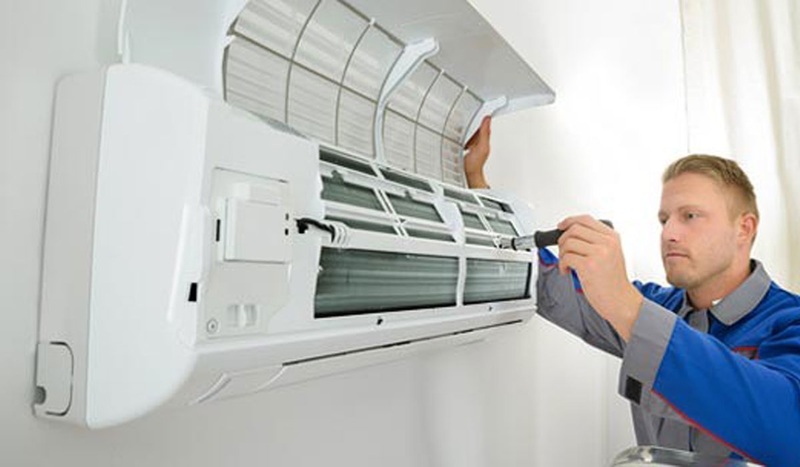 Air conditioning is one of the greatest inventions of the last century, but unless proper maintenance is performed, it can cause more headaches (and expense) than cool afternoons. What follows is a list of maintenance procedures to follow to ensure a steady flow of refreshing air this summer. 1. Have a professional come out and check out your system periodically. Ask for tips on how to troubleshoot between visits. Become familiar with your operating manual. 2. If your central air unit is equipped with a sight glass, check the refrigerant level and make sure there are no bubbles. If there is no sight glass, inspect the low-pressure refrigerant line for frost. If the refrigerant is low, there may be a leak which will need to be sealed. 3. Cleanse the condensing unit pan of bugs, leaves and dirt with a hose. See the operating manual to locate it. 4. Oil the blower motor and fan on both the condensing and the evaporation units annually. Again, your operating manual will describe how to do this and what type of oil to use. 5. Check the tension on the condensing and evaporation unit blower fan belts each spring. If the belts have more than an inch of give, they will need to be adjusted. Consult your installation manual. 6. Inspect the blower ducts and joints for leaks and insulation slippage annually. Rejoin leaking ducts with duct tape and reposition insulation. 7. Clean or replace air filters in both window (monthly) and central units (quarterly). 8. Clean window units, particularly the evaporation coil and fan blades. Oil the blower motor and the fan. Consult the installation manual. Follow the manufacturer's instructions regarding winter storage. 9. Check the joint between the window frame and the unit to be sure it is properly caulked and weather-stripped annually. 10. Inspect the blower motor fan blade for mold and/or mildew. If heavy buildup is present call your A/C contractor for treatment and removal. If it’s only moderate to light buildup, there are safe and effective chemical disinfectants that kill existing organisms and control new growth by spraying them into the filter intake. 11. If the coil has mold or mildew it also should be treated. Make sure that the face of the coil is clean so that air can pass through freely. The coil can easily become clogged when the filter is not changed regularly. To clean the coil, spray with "Blast-A-Coil” cleaner (available at hardware stores). Clean with a wire brush in the direction of the coil fins, then remove loosened debris with a vacuum hose. 12. In addition to mold and mildew, algae can build up in the condensation drain pan and drain line, causing sometimes substantial water spills which can cause damage to the system's controls and to the house’s structure. To kill and control algae, mildew and mold in your condensation drain pan and drain line you can place "Algae Strips" (also available at hardware stores) in the condensation pan. 13. Monitor your system by installing a thermometer in the supply duct and checking the temperature every two weeks. The supply duct temperature should be 17 to 22 degrees cooler than the inside air. 14. Set your a/c fan speed on high except in when it’s humid. In humid weather, set it on low, which maximizes cooling, and the slower air movement through the cooling equipment allows it to remove more moisture from the air. 15. Whole-house attic fans cool your home by pulling cool air through the house and expelling warm air out through the attic. These are most effective when operated at night and when the outside air is cooler than the inside. 16. Don't crank your thermostat as low as it can go when you turn on your air conditioner. It won’t cool your house any faster and the result is higher cooling bills. 17. Set your thermostat as high as comfortably possible in the summer. The less difference between the indoor and outdoor temperatures, the lower your overall cooling bill will be. 18. Don't place lamps, TVs or other electronic equipment near your air-conditioning thermostat. The thermostat senses heat from these appliances, which can cause the air conditioner to run longer than necessary. 19. Use an interior fan along with your window air conditioner to distribute cooled air more effectively through your home without a substantial increase in your power use. 20. Use plants to shade air-conditioning units but make sure the airflow isn’t blocked. A unit operating in the shade uses as much as 10 percent less electricity than the same one operating in the sun.